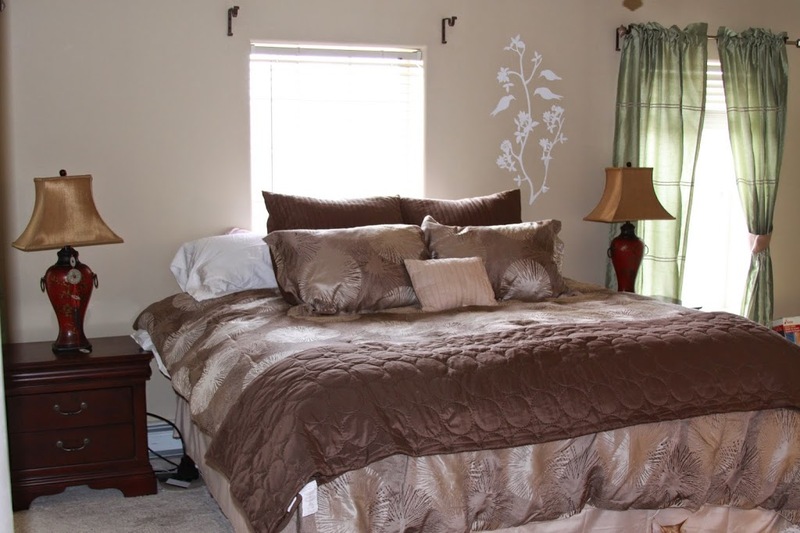 I’ve recently been re-designing my house with some major updates to the master bedroom as well as a huge kitchen remodel. 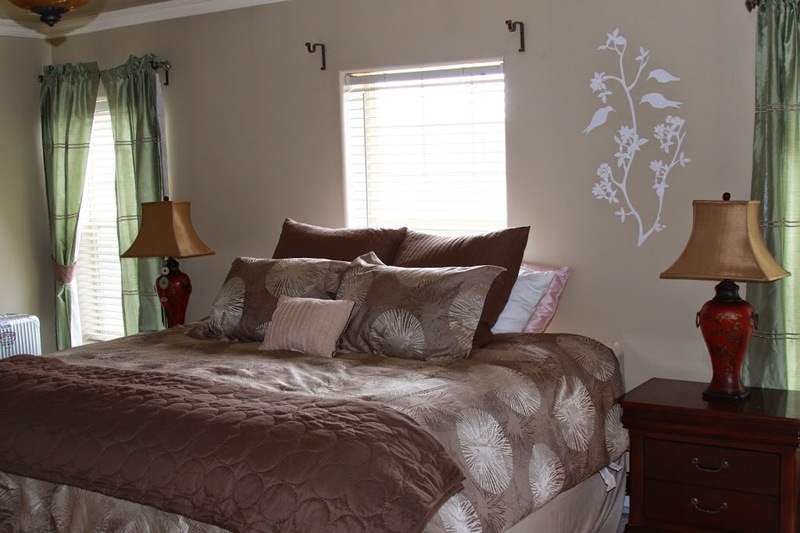 I have always shied away from interior design and it has always seemed a bit difficult for me, but I decided to give it a try by re-decorating the master bedroom. I was so pleased with the outcome, I’ve since moved onto the dining room and formal living rom. I had an asian theme going on in my bedroom (I’ve had it this way for about the last six years) and decided to update with some more pretty neutrals. My house is painted very neutral, with lots of beiges and whites throughout, so I decided to stick to this theme in the bedroom as well. I swapped out my dark cherry wood bedroom set for a more modern, and more oversized look from Restoration Hardware. I picked up the St. James bed frame, two oversized night stands, and a very oversized, tall dresser to give the room a grandeur feel. I especially love this bedding set because its made from old-refurnished wood, that will only look better with time as it gets more worn in. (If you have animals too, this is a great piece of furniture to use so that scratches don’t show up). 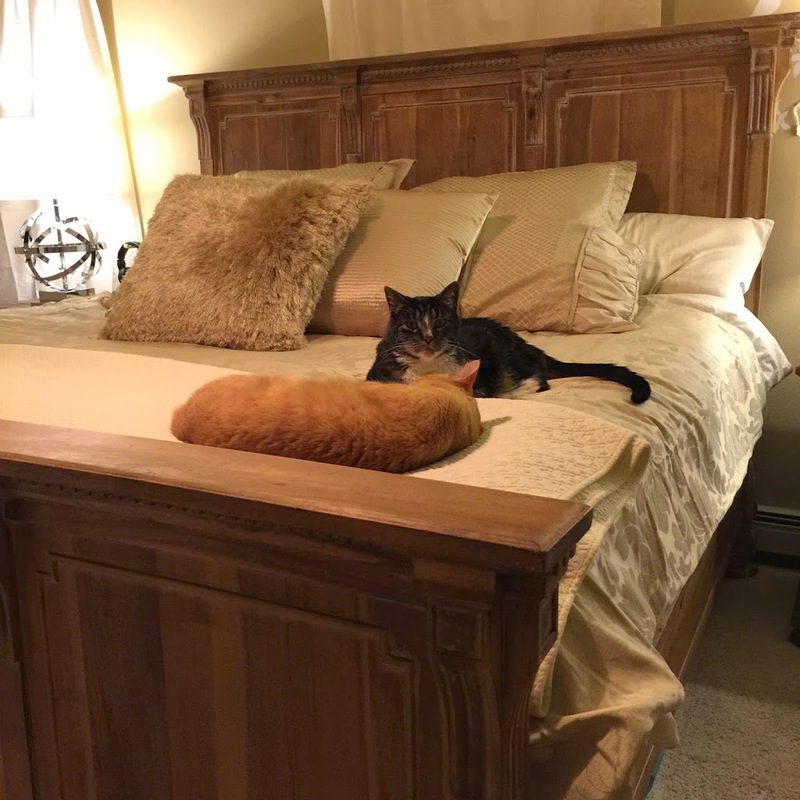 I picked a light wood that I knew would go great with very neutral bedding. Santorini mirror from Z Gallerie, as well as these cool Pinnacle table lamps. 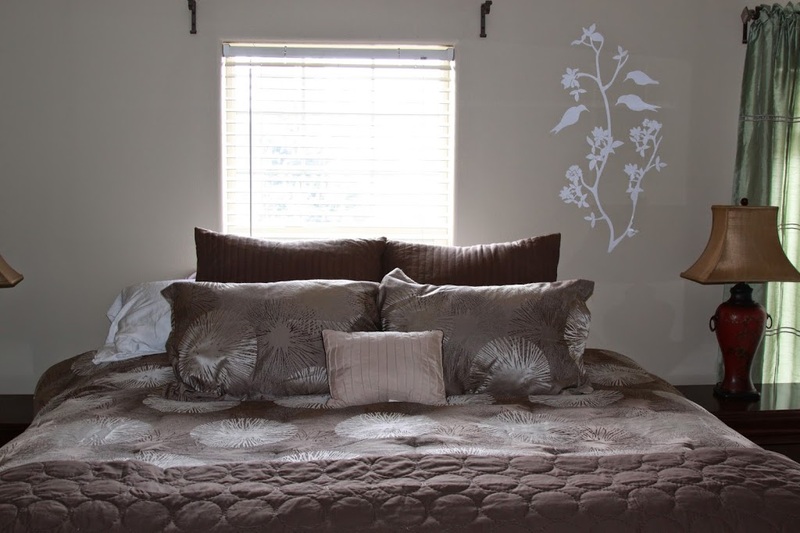 I decided to go with beige jacquard bedding (I also updated a similar fabric in my reading nook on the north side of the room) and got some big fun textured Surya throw pillows from Bedding.com, as well a beautiful white quilt to lay across the foot of my bed. To finish off the look, I got some big draped Vienna white curtains from Z Gallerie as well, and a big oversized white chair, white faux fur chinchilla throw, and a cool Mirrored Cube end table to sit under my TV and hold my Apple TV hidden away. All of these pieces from Z Gallerie. *Disclosure: I got this product as part of an advertorial. I wish I was more into home design, but to be perfectly honest, I struggle at it and feel like I always need someone to step in and give me a little help. If it comes to painting and wall paper, I’m completely terrified and most likely won’t risk it in a million years. Big changes scare me, especially when it comes to my living quarters. And let’s face it, to anyone who has taken the time and effort, not to mention money to repaint your home, how often has the color actually come out the way you wanted? I repainted every room in my last house only to be disappointed with every color choice I chose once it was on the wall and dry! These days I prefer to take less risk when it comes to designing my home, especially when it comes to the walls. Furniture, rugs, and art are all easy to move around and not so permanent, but when it comes to the stress of changing up the walls, no thank you! That is until I came across Wall Slicks! If you haven’t heard of Wall Slicks before, they are the answer to every home designing phobe’s prayers! Nothing permeant, super easy to take on and off, and won’t cost you NEAR as much as new wallpaper or paint! If you ask me, it also gives your home A LOT more personality then paint would anyway, because its Art! 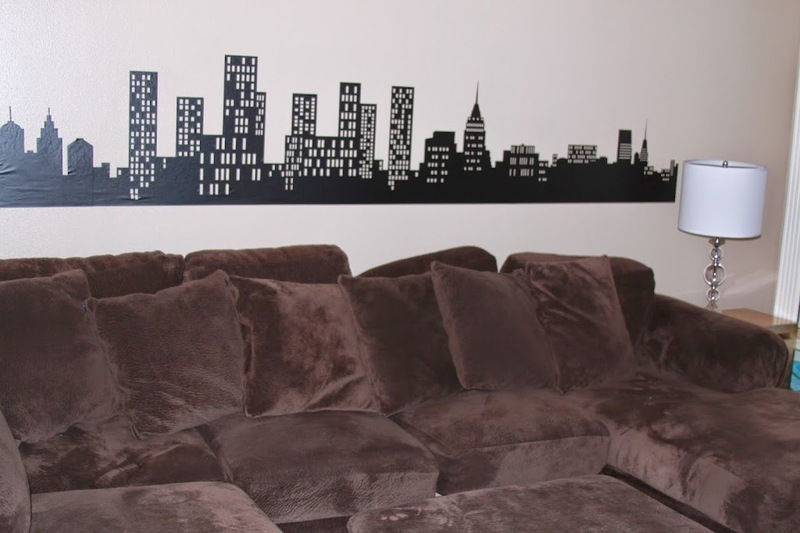 So what exactly are Wall Decals? Well, they’re basically a big sticker made to stick safely and securely to your walls, but can also be taken down easily if you get tired of them, and will not ruin your walls. When I first started seeing these beauties pop up on blogs, I was instantly intrigued. Wall Slicks is truly amazing art for your home! When I went to the Wall Slicks website, I was amazed with the selections! You can truly find everything for every style, every personality, and every room in your home! 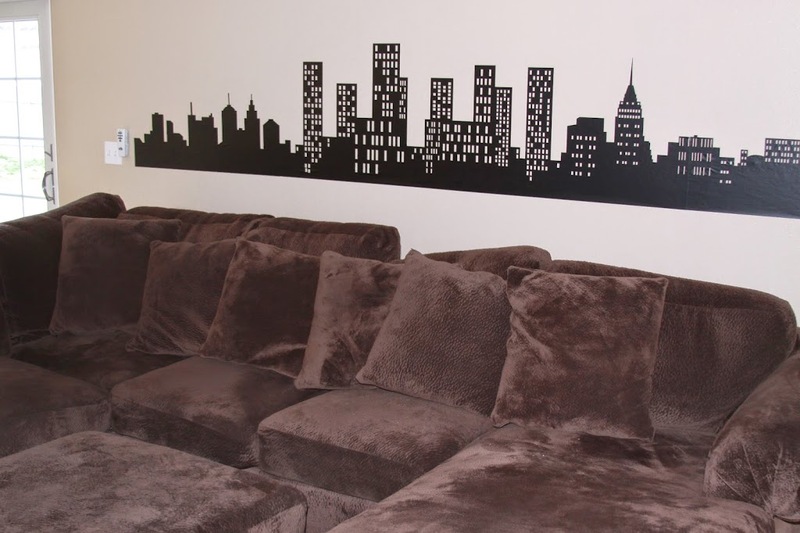 I shopped around the dozens of pages of adhesive wall and surface graphics! There was so much to choose from! 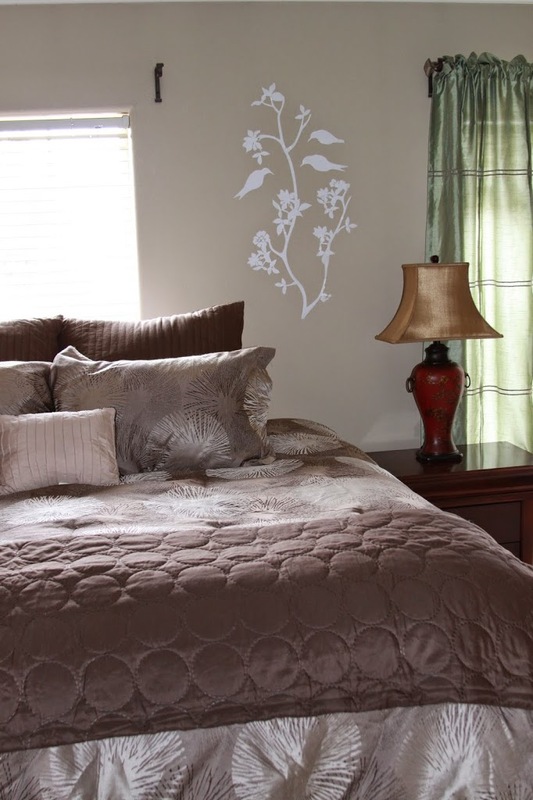 My Favorite categories, were the modern wall decals, geometric, and architectural decals. 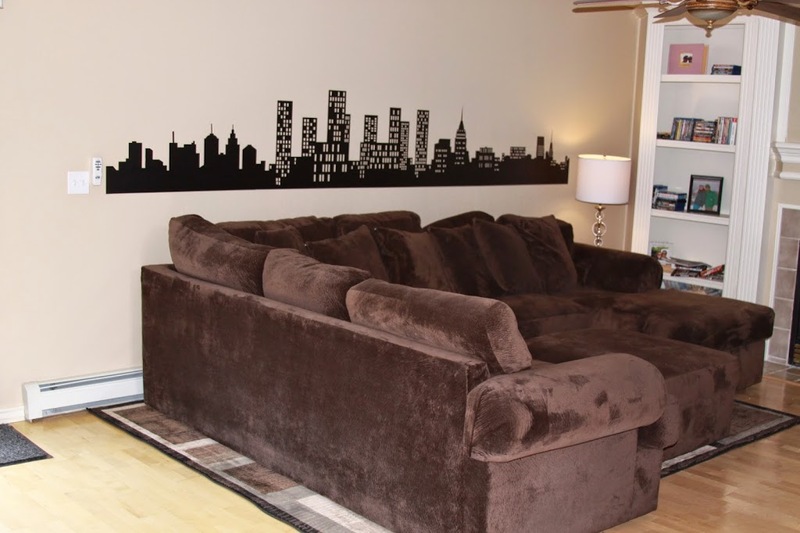 When I saw the City Skyline Decal, I knew right where I was going to put it instantly! I moved into my house about six months ago and still had no art for my living room. 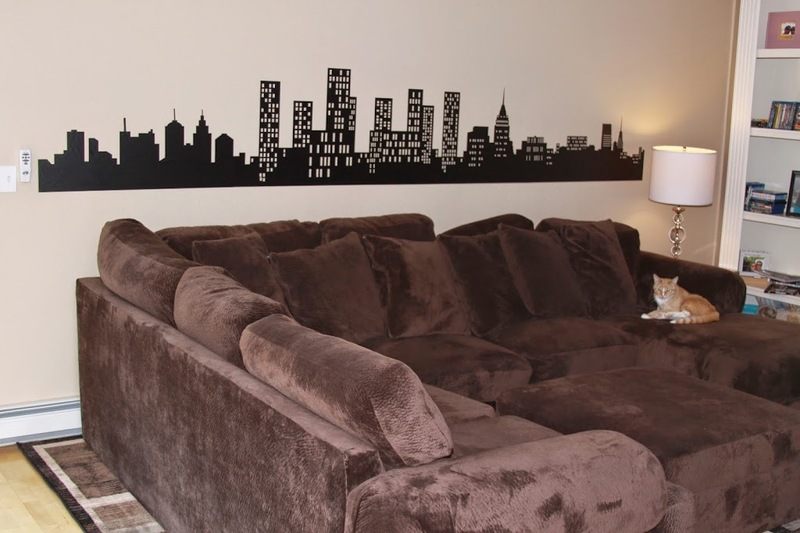 When I saw the City Skyline Wall Decal (Reg $120, on sale for only $60 right now), I knew it would look great right behind my couch, where my wall had previously been completely bare! My Bedroom also has an asian them to it, thanks to some lamps and artwork, and I knew I wanted a graphic for around my bed with that same theme. 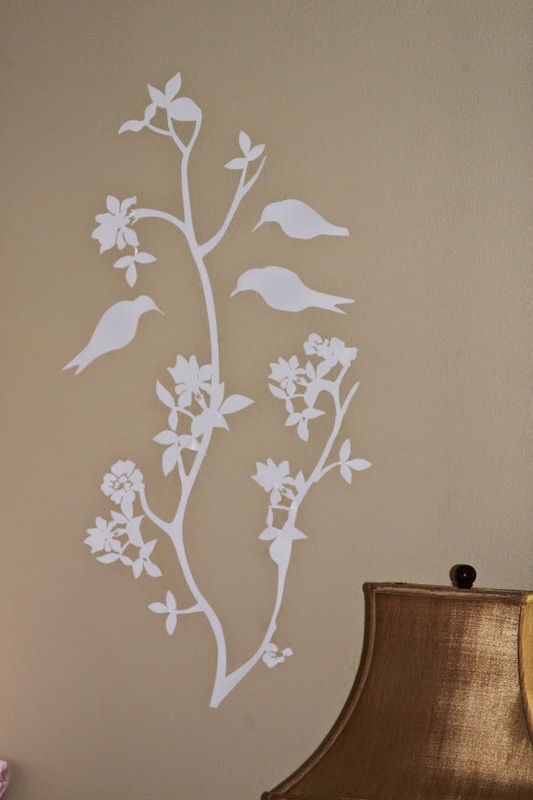 When I came across the Cherry Blossom Branch with Birds ($36), I knew that was exactly what I wanted! 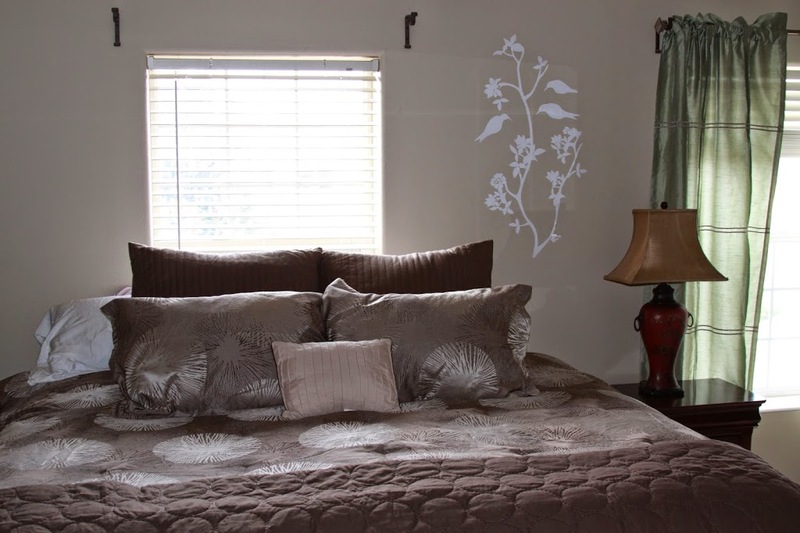 What is also really wonderful about these decals, is you can choose them in different sizes and almost any color imaginable too, so they will be sure to go with any color palette you have going on in your room. I tend to be a little color shy when It comes to my house (as you can see by my rooms here), so I went with a black city skyline for the living room and a plain white cherry blossom for the bedroom. I actually love how both look even being the neutral colors, however I think in retrospect, I would have gone with a cream or beige color for the cherry blossom, but I think it still looks pretty great and lightens up my room a bit. Now that you’ve seen how my Wall Slicks Decals added a fun flair to my rooms, you’re probably wondering just how easy they are too put on and if they actually stay in place, right? When attaching mine, I quickly realized it is a two man job. You need someone to be able to hold the big adhesives, while the other person smooths it onto the surface. The great thing about these graphics is that you can reposition them even after you’ve stuck them on and they will still stick! My only suggestion is to clean your wall first before you apply them. My walls were a little dusty and I learned after the first attempt that I needed to give them a good wipe down to get the most out of my Wall Slicks. Also, when attempting these graphics, especially if you choose a huge one like my City Skyline or very small, detailed graphic like my cherry blossom, plan on setting an hour or two aside to do it. You don’t want to rush through this. It does take some time to get these placed on your wall, especially when they are as intricate and detailed as the cherry blossom branch. Also, another tip, when placing the decals, remove only a little backing at a time, otherwise you can get it tangled and it WILL stick together and ruin. I learned this the hard way with the other half of my cherry blossom branch. And don’t even think about letting it stick to itself. You will be hugely disappointed. Not sure you dare do it yourself? Wall Slicks offers videos to show you how to do it too, just check out their website and get all sorts of tips for applying your adhesives perfectly! Overall, I love the look of my Wall Slicks. I’ve had them on my walls for a week now and they are holding up just fine and look really great! I really love the artistic flare it gives my space and I love that If I get sick of them, I can easily take them down and put up something new! They are also guaranteed to come off as easily as they went on, and leave no residue behind on your walls! I love that my Wall Slicks are so much less expensive than paint and wallpaper (Although you can even get Wall Slicks that look like wallpaper) and will save you so much more time! Just be patient and set aside some time to properly stick them to your walls and you won’t be disappointed! My one suggestion would be to start with something easy so you get the hang of it, then move onto more detailed, bigger graphics. If you would like to learn more about Wall Slicks or pick up some great adhesives and graphics for your walls, then be sure to check them out today at WallSlicks.com.